Hannah Arendt var en av 1900-talets viktigaste filosofer och politiska teoretiker. Sakligt och elegant beskriver Margarethe von Trotta arbetet med Arendts mest berömda verk Den banala ondskan, som hon skrev efter att ha besökt rättegången mot Adolf Eichmann i Jerusalem 1961. Ställd inför en av Förintelsens arkitekter menade Arendt att ondska inte behövde uppstå på grund av djävulska intentioner, utan ofta bara var avhängig medelmåttighet och ignorans. Analysen var extremt kontroversiell även bland Arendts samarbetspartners och meningsfränder. 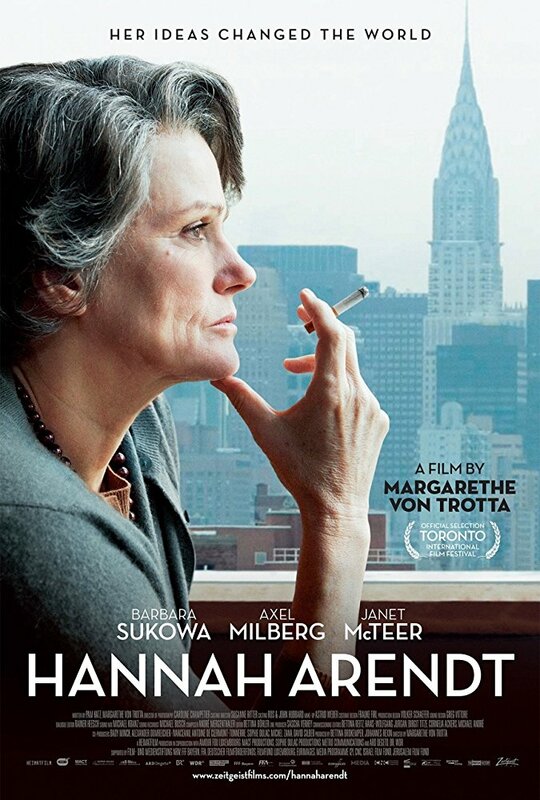 Hannah Arendt är något så ovanligt som en film om idéer som är både lättillgänglig och mångbottnad. Dessutom är den en inkännande skildring av en outtröttlig och stridbar människa. Barbara Sukowa är exceptionell i titelrollen. 2013 vann hon det nationella filmpriset German Film Award och nominerades till en European Film Award för sin tolkning. The film portrays Hannah Arendt (Barbara Sukowa) during the four years, (1960-64), that she observes, writes, and endures the furious reception for her work about the trial of the Nazi war criminal, Adolf Eichmann. Watching Arendt as she attends the trial, staying by her side as she is both barraged by her critics and supported by a tight band of loyal friends, we experience the intensity of this powerful Jewish woman who fled Nazi Germany in 1933. The fierce, chain-smoking Arendt is an exile who is happy and flourishing in America, but whose penetrating vision makes her an outsider wherever she goes. When Arendt hears that the Israeli Secret Service has kidnapped Adolf Eichmann in Buenos Aires, and brought him to Jerusalem, she is determined to report on the trial. 'I never saw these people in the flesh...' she writes in the New Yorker magazine, and 'To attend this trial is an obligation I owe to my past.' William Shawn (Nicholas Woodeson), the editor of the magazine The New Yorker, is thrilled to have such an esteemed intellectual cover the historic process, but Arendt’s husband, Heinrich Blücher (Axel Milberg), is not so sure. He worries that this encounter will put his beloved Hannah back into what they both call the 'dark times.' Arendt enters the tense Jerusalem courtroom expecting to see a monster and instead she finds a nobody. The shallow character of the man cannot be easily reconciled with the profound evil of his actions, but Arendt quickly realizes that this contrast is the puzzle that must be solved.